AWB crew paged to back-up ILB to assist 4 fishermen at Talacre beach. See ILB services for full report. AWB had just entered the water when it was recalled. AWB crew paged to launch to assist 21ft clinker-built motor vessel “Dragonfly”, with 4 persons on board, on passage from Liverpool to Rhyl. The boat was waiting for the tide to get into Rhyl, but had been caught in the surfline, and the anchor was dragging. The men had only a mobile phone for communication, and they contacted the Coastguard via that. The AWB launched into a NNE force 6 wind, with breaking seas about 1.5m high up to 1/2 mile out. Because the boat was about 150m near the shoreline, but the AWB was on the outside of the outer bank from the boat, the ILB was requested to launch to transfer a towline from the AWB to the casualty. The ILB launched, and approached the AWB with great difficulty. As there were only 2 crew on the ILB, the station mechanic transferred to the ILB, to enable the other ILB crew to tend the towline. The towline was then taken from the AWB to about 50m from the casualty, under great difficulty because the ILB was stern-to with the breaking seas. The ILB crew showed good seamanship in carrying out this manoeuver, but were unable to get to the casualty as it had drifted about another 100m along the surfline. The towline was therefore recovered, and the AWB tried to get closer, but was unable to get across the shallow bank, and was getting a hard ride from the breaking seas. At this stage, the AWB coxswain instructed the ILB to evacuate the crew from the motorboat, as seas were breaking over the boat, knocking the occupants to the deck. This was undertaken with superb seamanship, and the ILB successfully transferred the 4 persons to the ILB. There were now 7 people on the ILB, and it shipped 2 heavy seas, half-filling the ILB, but it successfully returned to the shore about 150m away, and waited for the Tractor to recover the boat, whilst the Coastguard shoreparty stood by assisting with the casualties, 2 of whom were suffering from hypothermia, and lapsing into unconsciousness. An ILB crewmember also suffered a badly-sprained wrist in the rescue. All persons were transferred to ambulance at the boathouse, and the ILB crewmember was taken to hospital by Coastguard auxiliaries. The AWB stood by to try to recover the boat, but it did not prove successful, as the boat was now in the surfline with breaking seas causing damage to the boat. As the AWB was standing by, the crew saw a red flare from Towyn area, and proceeded there. The flare was very low on the shoreline, and a search did not find anything. The AWB returned to station and was ready for service by 2230. All injured parties were released from hospital later that night. The boat subsequently was washed ashore 1/2 mile from the boathouse, and was broken apart by 2 high tides. The AWB had just launched on exercise when Holyhead Coastguard paged the Honorary Secretary. The police at Abergele had requested lifeboat assistance to recover a 43-year old male who had entered the water. The police helicopter NW1 was also on scene. The boat proceeded, and had been going for about 5 minutes when the coastguard was informed that the person was now in police custody, and the AWB could stand down. The exercise was then resumed. Report of fire on board the Douglas Gas platform complex. Rhyl and Llandudno lifeboats paged to bring to immediate readiness to assist should evacuation be necessary. Boat had just come out of boathouse when Holyhead Coastguard reported that fire was out and boats could be stood down. This was done by 1812. AWB launched to back-up ILB, Police, Helicopter and Coastguards in search for person reported in water in Rhyl Harbour. See ILB report for fuller details. AWB searched off river Clwyd harbour entrance, and ILB searched harbour and inshore, until search was called off about 0420. This is strictly not a “Rhyl Lifeboat” service, but is recorded here as the Rhyl crew were instrumental in the service. The relief lifeboat 12-25 “Bingo Lifeline” had left Rhyl at 1215 to rendezvous with Llandudno lifeboat, after completing relief duties at Rhyl. Our station boat “Lil Cunningham” had sailed from Menai Bridge to Rhyl at 1100, and had passed us off Llandudno. The “Bingo Lifeline” was following Llandudno lifeboat up the Menai Straits when the call came from the 18′ speedboat “Crimson Too” with 3 persons on board, that they had broken down off Bangor pier. “Bingo Lifeline” went alongside and found that the electrics on the boat had failed, but the boat was riding at anchor and in no immediate danger. They had seen 2 lifeboats go past within 3 minutes and thought they would be able to get help rather quickly. “Bingo Lifeline then proceeded to Menai Bridge to pick up the Llandudno crew, who were leaving their boat there for refit work, and taking over “Bingo Lifeline” as the Llandudno station relief boat. So the casualty had 2 lifeboat crews go to their assistance, but on the same boat! The casualty was then reached again, and the 2 station mechanics went on board to try to affect a fix to the engine. This was unsuccessful, so the Lifeboat took up the tow and proceeded at 8 knots to Conwy Marina, which was on the way home for the Llandudno crew. The marina was reached at 1715, and the boat was safely taken into the marina. The Rhyl crew were then delivered to the “Beacons” landing stage off the Conwy estuary where the Rhyl LandRover LR26 was waiting to return them to Rhyl. The “Bingo Lifeline” was then taken over as Llandudno station boat and returned to Llandudno at 1745. I have not recorded this in the services totals for 2001, until the RNLI has confirmed whether this service will go down to Rhyl, Llandudno, or to a boat on passage. Rhyl AWB launched to assist the 2 persons on board motor boat “Gabrielle”, lost all engine power, drifting approximately 19 miles North-North-West of the boathouse. The boat had been drifting for many hours, and the 2 crew were tired, and in the middle of the main Liverpool shipping channel entrance, about 7 miles beyond the Douglas gas and oil platform. The AWB launched by 0902 and reached the casualty about 90 minutes later, using the VHF direction-finding equipment to target the casualty. When found they were over 20 miles from Rhyl. They had attempted to get to Lytham in Lancashire, but were exhausted. The boat was taken in tow and headed towards Lytham. 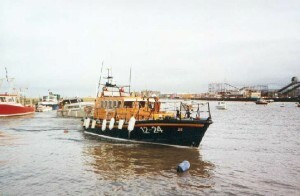 The Lytham Lifeboat 12-30 “Her Majesty the Queen” had launched at 1000 to rendezvous with the Rhyl AWB, and take over the tow back to Lytham. This was done about 12 miles from Lytham, and Rhyl Lifeboat then returned to North Wales, to Rhos-On-Sea, where it was the local Flagday, and the crew had promised to attend. The local MP and dignitaries were taken on board and given a “trip round the bay”, and the boat then returned to Rhyl, being ready for service at 1645, some 8 hours after the call. Over 100 miles were travelled on this service and exercise, using 400 litres of fuel. AWB launched to search for a child missing at the water’s edge at Sandy Cove, 1.5 miles West of the boathouse. AWB arrived on scene 5 minutes later, but the Coastguard at Holyhead reported child had just been found safe and well ashore. AWB was then diverted to assist ILB in searching for 2 missing children, missing for nearly 2 hours from the Rhyl promenade area. The AWB and ILB searched together until 1755 when it was reported that the 2 children (1 of whom had a mental problem) had been found safe and well by the paddling pool on Rhyl promenade. AWB and ILB returned to station by 1840. AWB launched to search for 2 jet-powered speedboats, which had launched from Prestatyn that morning, with 5-7 persons on board, last seen going towards the Douglas gas platform. They were 2 hours overdue, and the weather was gusting between 5-6 Westerly, with seas forming breaking and cresting waves. They were reported overdue by the Prestatyn sailing club, who had agreed to pull the boats out of the water when they returned. The AWB launched and proceeded to about 1/2 mile off Prestatyn, then going in a straight line towards the rig. 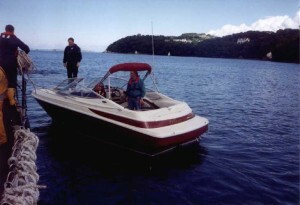 It was ascertained that the boats were carrying a small handheld VHF radio and mobile phone. It was reported that neither boat had a compass. The AWB had been searching for about 45 minutes when the Rhyl Coastguard mobile patrol on the top of Gwaenysgor mountain, behind Prestatyn; could see the boats about 1 mile off the Lifeboat, and about 1 mile further inshore. It was difficult to see the boats from the AWB as there was a lot of flying spray, it was getting dusk, and both boats were white in colour. 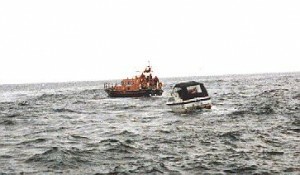 After a further 15 minutes, the 1 boat was spotted, and was followed by the Lifeboat. It was difficult to get near, as every time the Lifeboat closed on the boat, it sped off. The boats were eventually followed until they got back to the beach at Prestatyn, where they were met by the Coastguards. Communication was difficult due to the people on the boat only having a small knowledge of English, being of Asian(chinese) origin. It transpired that 1 of the boats had broken down, and that they had managed eventually to restart the engine, but did not think to inform those ashore of their being overdue. Luckily everything turned out OK, and they were put right in the ways of the sea by the Coastguard mobile patrol. The AWB returned to station, being ready for service by 2145. AWB requested to launch by coastguard, to back-up ILB going to 3 inflatables off Abergele. The AWB was just on the point of launching when the all-clear was given by the coastguard, so the AWB returned to station. For full report, see ILB page. Rhyl Coastguard mobile tasked to object in water at Pensarn, 4 miles West of station. When on scene, looked like a person in the water, so the AWB was called for, as the wind had been North Westerly 5-6 for many days (onshore), and sea was very rough. The boat was just being taken on to the slipway when the Coastguard mobile reported that the object had come ashore, and that it was an immesion suit as worn by oil rig workers, but no person inside. The Coastguard recovered the suit, and as it appeared to have been in the water for some time, the AWB was stood down at 1316, being rehoused by 1321. AWB requested to go to Pensarn beach, Abergele, to attend a child being swept out to sea on a Li-Lo. The child was rescued by a member of the public, and the boat was stood down. See the ILB report for more detail. AWB requested to launch to a 16 foot day boat with engine broken down off Rhyl. As the boat was reaching the water’s edge, the day boat managed to start their engine and proceeded at full speed towards Liverpool. It appears the boat in question had also been in difficulty off Towyn earlier, and this was the same boat that the ILB was proceeding to when the call came to investigate this boat off Rhyl. Holyhead Coastguard contacted the dayboat by mobile phone, and they said they had fixed their engine and were now going to New Brighton (near Liverpool) under their own power. The AWB was stood down just as it entered the water, and the AWB returned to station at 1640. AWB launched to assist the 32 feet Princess cabin cruiser named “Lisanne”, which had steering problems, just off the end perch marking the approach to Rhyl harbour, with 2 persons on board. The AWB approached the casualty, and when alongside, a crew member was put on board the cruiser to assist with the tow. An auxiliary drogue was attached to the stern of the casualty to maintain a straight tow into the harbour. The tow took about 15 minutes to get alongside the quay wall. The AWB then had to wait in the harbour until there was sufficient beach on the ebbing tide to recover the boat at the boathouse. The service was completed by 1530. AWB launched to search for a male attempting suicide by wading into the sea off Kinmel Bay, 1/2 mile to West of station. The ILB was also launched 5 minutes later to search closer inshore. Rhyl Coastguard mobile, Police helicopter NW1, and various other police officers were also involved. The AWB arrived on scene after 4 minutes, and was searching when the coastguard were notified by Police HQ that the person had been apprehended ashore, and all units were stood down, returning to the boathouse by 1730.